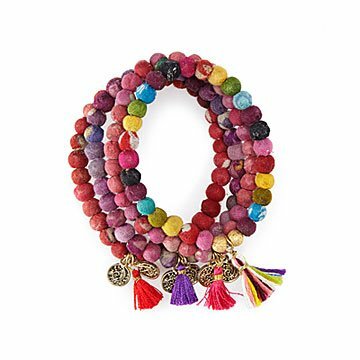 Beads made from reclaimed kantha cloth make this vibrant bracelet set extra special. Unity, compassion, wisdom, energy—these are important pillars that keep us connected, human-to-human. Wear representations of them all with this set of four eye-catching bracelets, each attached to a notecard explaining its significance. The beads are crafted from vibrant, reclaimed kantha fabric—a visual reminder that it"s always possible to start anew. Keep the set and wear them stacked together, or make it a thoughtful gift for a friend that could use an inspiration boost. Handmade by women artisans in India.